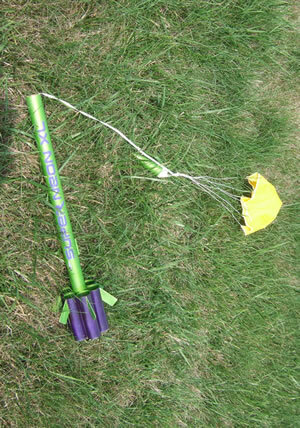 The Super Neon XL from Estes is a modified tube-fin rocket with a beefy appearance and an E engine mount. 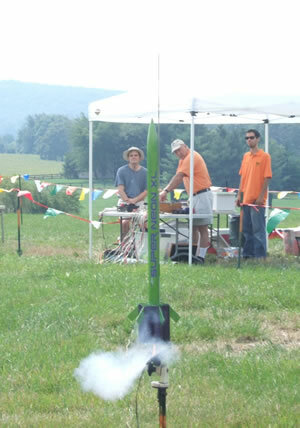 As one of the taller Estes kits, it is certain to draw a crowd among the E2X flyers. The only exceptional thing about this kit is the high-quality balsa nose cone. right out of the bag it had a good weight to it, and with wood filler and gloss paint it is a thing of beauty. Construction of the Super Neon XL was only slightly more challenging than the Alpha III "plastic at both ends" kit. The tube fins are constructed in pairs, and a balsa spacer is included to make mounting the balsa parts to the tubes flawless. The six tubes fit around the central BT60 perfectly, and fillets built up quickly using Titebond wood glue. If I were building another one, I would consider mounting the tube fins about 3/4" back from the end of the body tube, to recess the motor mount and motor hook and allow the rocket to sit flat on the tube fins. As it is, I display it on a roll of duct tape, with the engine hook hanging down into the roll. A few things make finishing this rocket a challenge: 1) it is nearly too long to hold my hand for spray painting, 2) masking tube fins is time-consuming and not for the impatient, 3) spray-painting the inside of the tube fins evenly is not within my skill set. On the plus side, BT spirals were not that pronounced, and smoothed out with several coats of primer, and the nose cone and fins were easy to smooth with thinned Elmer's Wood Filler. I painted the main body and fins with Testor's metallic lime green, and then masked the balsa fins and the main BT and painted the tube fins Testor's metallic purple. Two choices of waterslide decals were included in the kit, purple or silver. The purple was pretty close to the purple paint, so I soaked that decal and applied it to the rocket. Once the decal was completely dry, I applied 2 coats of gloss clear coat and we were ready to fly. The first flight was on a D12-5, and it went up nice and straight, without any wobbling or spinning. The -5 was perfect and the big parachute brought the rocket slowly back to earth. The second flight was a bit more exciting, with an Aerotech E20-7W composite single-use motor. 5-4-3-2-1-CRACK! The rocket was gone so fast you might have suspected a CATO except for the smoke trail heading up to the heavens. The ejection event happened some time while the rocket was up there, I just couldn't see it. The charge was forceful enough that it blew the wadding through 3/6 of my shroud lines and the rocket game down quite fast. Lucky for me, the only damage was the shroud lines, which had parted at their midpoints. I installed a new nylon parachute for the next months launch event, installed another D12-5 and dog barf, and enjoyed another picture-perfect launch. The standard tri-fold shock-cord mount is what I used during construction, but I suspect that it will be replaced when I get around to making a baffle for this monster. Otherwise it takes a large amount of dog barf wadding to fill the body tube. I think that replacing the plastic parasheet with nylon was the best upgrade I could have made, I will be flying this rocket with 0 recovery worries on the nylon 'chute. I like this kit, it is a nice departure from the 3FNC or 4FNC kits that all start to look the same after a while, only with different names. Good build, durable engineering, and beefy good looks add up to a nice kit. I just wish that Estes would include a better recovery system than the tri-fold paper mount and the plastic bag parachute. If you take your time, it is very hard to screw up a 6-tube tube-fin rocket. When we tie a string to it, and do the little test, the rocket flies in no particular way. I have never really had a problem getting a rocket to pass this test.Ive read a couple reviews, like this one where everyone says they had no issues w straight flight. Any ideas? Any concerns? For the weight of this rocket, it kind of looks like there should be more fin area. Just fishing for ideas... angus is going to be upset if this bad boy flames out. Part of the game i guess.